Wow…I am very pleased that Iain Heath (aka Ocre Jelly) liked my Bosco Verticale build and I have been blogged by The Brothers Brick – only the best LEGO blog on the web!! Categories: Architecture | Tags: Architecture, Boeri Studios, Bosco Verticale, Building, Lego, MOC, Stefano Boeri, The Brothers Brick | Permalink. 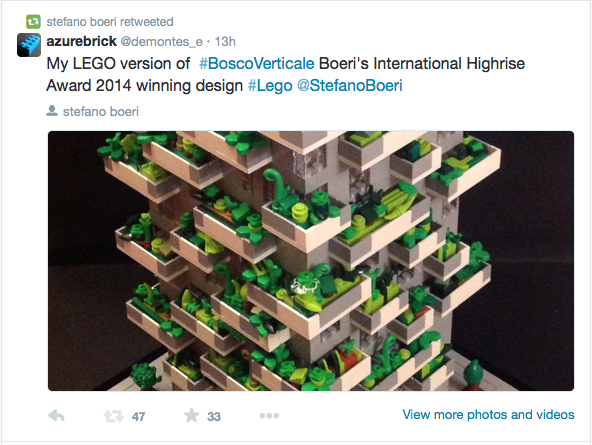 I’m very pleased that the Architect who designed Bosco Verticale, Stefano Boeri, re-tweeted my LEGO version of his design! Categories: Uncategorized | Tags: Boeri Studios, Bosco Verticale, Lego, Skyscraper, Stefano Boeri | Permalink.